I had a job this morning. Then a break. Then a long piece of work. I knew this going into the day so I took my laptop so I could write during that three hour gap. I managed to get caught up in my NaNoWriMo word count. I did some thinking on the page. And I let the character lead the way and just observed, writing as she went, and did not try to force her back into the little bubble I created as a frame for this year's novel. It went much better that way. I thought that this year I had a good idea. No, I had a good idea which was worth trying and I did, but I got a little stuck so I decided to move on and, again, let the characters take the lead. This is my fun part. It gets messy, sure. But it's fine. I enjoy putting words on the page and/or screen. I love letting the language flow and letting it be whatever it will be and seeing where it goes. So I did. And it moved. I believe I'm through the little stumbling place and will be back on track. And I wrote a lot of words today and got caught up with the daily average word count target. Until midnight. Then it starts again and I have another chunk to go. That, my friends and followers, is NaNoWriMo. My ending word count for Day Five is 8,436. How did you make this or find this. I'm a huge whovian and fell in love as soon as i saw this lat year. Hi, Deanna - I did not make this. And I honestly don't remember where this came from. It may have been in the NaNoWriMo.org website. There is usually a calendar thread in the forums. 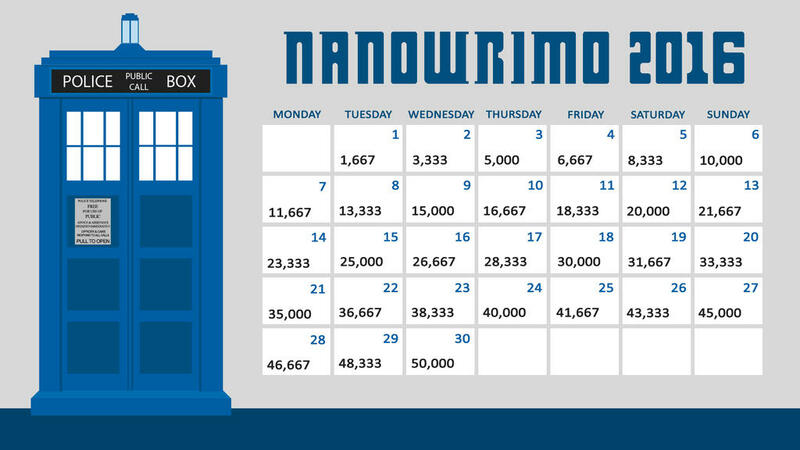 You can also try a search for nanowrimo calendar - which I just did with Google images - and this one came up in the early choices.